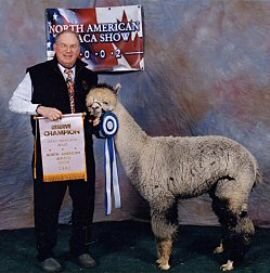 Ansel comes from a terrific background with a notable sire Platinum who has himself is a two time reserve champ, with a number of blues under his belt. Ansel himself, is a very striking, photogenic male. His fleece is very dense and he has tremendous presence. A real show-stopper. 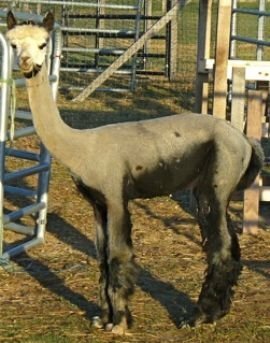 He works well on a halter, is mild mannered and will make a great pet or fiber animal. He would be sold as a non-breeder. As he is still intact, should he be sold and used as a stud, a supplemental fee would be added to his purchase price. Come take a look at this true masterpiece! SPECIAL *** Purchase with a second male, and take 50% off. (Lower price prevails). Molly is a young tried and true mom with a very inquisitive personality. 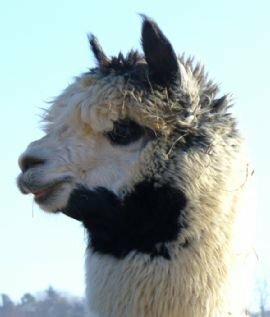 Because Molly had blessed Island Alpaca with both a wonderful male and female, Ansel and Annie, this allows us to offer a wonderful proven female still in the beginnings of her reproductive career. Molly should produce an even more impressive cria next year, as she is sold bred to the incomparable Island Alpaca Captain Jack for May 2009 cria. Medium silver grey Platinum has won two Reserve Championships along with four 1st place blue ribbons.